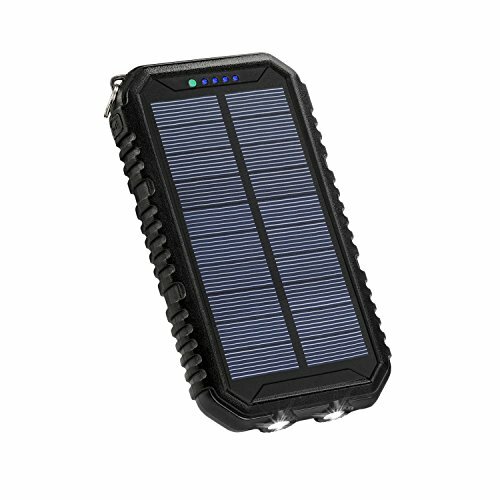 If you go outdoors,Waterproof Solar Power Charger is a must-have for outdoor use. WBPINE solar charger can provide endless energy for your devices, completely replacing pollutional battery pack to protect environment. With WBPINE solar charger , you need not worry your devices run off power, enjoy the greatest happiness during your travel. Built-in 2*5V/2.1A USB ports, allow you to charge two devices at the same time, the solar power charger provides great convenience with you and your friends who needs charging services.. Quick charging current and charge 2 devices at the same time. Compact size with the free hook, easy to hang on your backpack when outdoors, perfect outdoor on the go charger solution. WARRANTY 18 months warranty. 100% satisfaction service promise. If there is any problem, please feel free to contact us! High Capacity: Built-in rechargeable 12000mAh battery can charge iPhone 5S(4 times),iPhone 7(3 times),Galaxy S6(2 times),Huawei(3 times),iPad(2 times);.WEPINE Solar Phone Charger is the best gift and best choice for outdoor activities as hiking, camping and so on. 2 LED flashlight & 4LED indicators:2 Bright LED flashlight lighten your night when going for an outdoor camping and Integrated 4 LED indicators to show power status. What You Get: WBPINE 12000mAh Portable Solar Charger, Micro USB cable, User manual, Carabiner; 18-Months Warranty - Friendly Customer Service within 12 hours. If you have any questions about this product by WBPINE, contact us by completing and submitting the form below. If you are looking for a specif part number, please include it with your message.